There are four ICAO NAT Ops Bulletins due to go into effect on March 28th, 2019. The PBCS tracks will be expanded, real-time Space-Based ADS-B surveillance and reduced separation standards will be introduced, and the regional contingency and weather deviation procedures will be changed. Lowdown: There are some specific procedures that need to be incorporated into Pilot and Dispatcher training programs. The bulletin details proper waypoint insertion and verification procedures. Operators must ensure their training programs, appropriate manuals, and SOP’s incorporate these special emphasis items and that their dispatchers and flight crews employ them. This is considered a critical method of mitigating the risk associated the rapidly changing procedures (contingency) as well as reduced separation operations (ASEPS and PBCS) within the North Atlantic. Lowdown: Performance Based Communication and Surveillance (PBCS) tracks may be extended beyond the current three track maximum. They will continue to be identified in each track message and may vary day to day as traffic requires. They will continue to be only FL350 to FL390 inclusive and only on the designated tracks during the period the tracks are in effect. There may be days where there are no PBCS tracks, 3 PBCS tracks, 5 PBCS tracks, potentially even all the tracks. Lowdown: The contingency procedures will change, as part of a trial implementation. This will be in all the FIRs in the NAT Region and the New York Oceanic West FIR. These new procedures are to be utilized by all aircraft, at all altitudes, within this airspace. The fundamental change is that instead of doing a turn of at least 45 degrees and offset by 15 NM, you now turn at least 30 degrees and offset by 5 NM. For weather deviations, you used to do your 300 ft up/down offset when 10 NM away from track – you now do this when 5 NM away. For more info on this, read our article. Lowdown: A new trial will be implemented on the NAT called ASEPS (Advanced Surveillance Enhanced Procedural Separation) using ADS-B in the Shanwick, Gander and Santa Maria FIRs. Compliant aircraft will see a reduction in longitudinal separation to as close as 14 NM. This is not restricted to particular tracks or altitudes, just between properly equipped aircraft – you’ll need RVSM/HLA approval, ADS-B, and to be fully PBCS compliant (that means meeting the specifications of RNP4, RCP240 and RSP180). 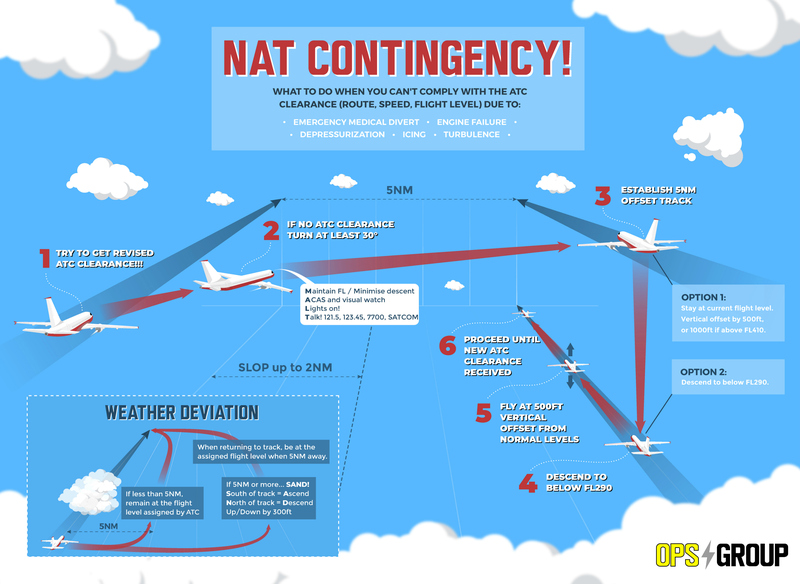 For a bit more of an in-depth look at the contingency and weather deviation procedures as shown in the image above, read our article. 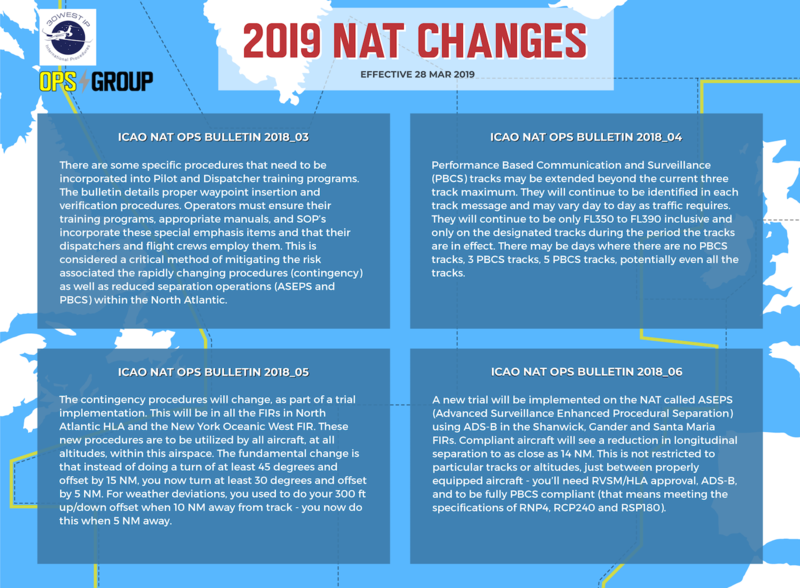 And if you’re still hungry for more NAT info, we highly recommend you check out the replay of the webinar hosted by Mitch from 30WestIP, titled: ‘A North Atlantic Game Changer, 4 NAT OPS Bulletins all go into effect in one day’. This really breaks down each of the four new Bulletins which take effect from 28th March 2019 – essential viewing if you operate over the North Atlantic! View it here. On 1st Nov 2018 we had a call with 140 OPSGROUP members about upcoming changes on the NAT in 2019, and how we can effect change. OPSGROUP members can find the PDF notes of this in your Dashboard. A big thing driving the ASEPS trial is the rollout of Space-based ADS-B, which is scheduled to complete its deployment by 30 Dec 2018, giving us worldwide, pole-to-pole surveillance of aircraft. For more on that, and how it will affect operations on the NAT specifically, read the article by Mitch Launius here. Use our quick guide to figure out where you are welcome on the NAT, depending on what equipment and training you have.